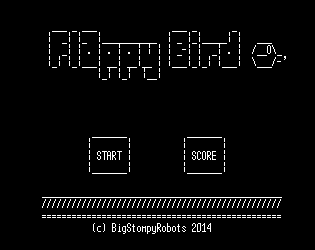 Made especially for the #FlappyJam: Ascii Bird. While checking out some of the other CandyJam submissions, I came across some games done using the Twine (www.twinery.org). It looked like a pretty interesting tool, and something that I would like to learn a little more about. In a totally unrelated instance, I was having a chat with someone about Flappy Bird, and I bet them that I could make Flappy Bird in Twine. A day of learning how to use Twine later and here we are. - Use the prompts at the bottom of the screen to tap or wait. - Don't let the bird hit the pipes. - The game randomly picks which pipes come at you and when. - Aim for a highscore!